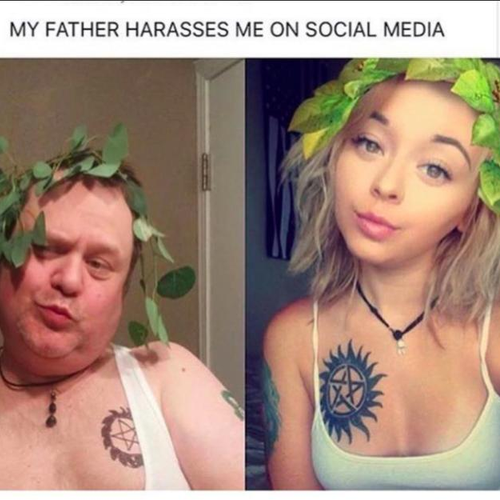 Dad Gets 40k More Instagram Followers Than Daughter And The Reason Will Make You LOL! Cassie Martin was shocked to find her dad has been doing HER selfies even better than she does! As a parent it can be a little bit frustrating when all your teenagers want to do is play around on their phones all day. Well, Cassie Martin's dad decided to take matters into his own hands when he spied one of the selfies she had taken on Snapchat. The teenager had used the face filter function on the photo-messaging app to transform herself into a hippie goddess complete with an ethereal flower wreath in her hair. But when her comical dad saw the image, he decided to re-create it, making sure that he included every aspect, even the foliage and a drawn of version of her tattoo design. Luckily, Cassie saw the funny side to her dad’s prank and it wasn't long before the pictures went viral after being uploaded side by side to Imgur. The photo, which was captioned: “Well he nailed it”, has already been viewed over 94,000 in less than a day and has received almost 200 comments praising Cassie's witty father. 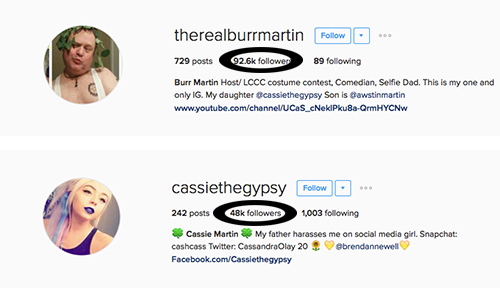 But since then things have got even MORE out of hand...Cassie's dad has his own Instagram account and he has over FORTY THOUSAND more followers than his daughter! Which selfie is better? We think it's 1-0 to Cassie's dad!